is an expression for how much the department actually has been “running” within a specific calendar time: The Run Factor represents how long time the system has been in operation related to a period like the day, the month or the year. is an expression for how much the department has been “available” for operation within a specific calendar time: The Availability Factor represents how long time the system has been in actual operation together with the time where the system was ready for operation, but for circumstantial reason was stopped. Again this is related to a period like the day, the month or the year. The size of the Availability Factor will always be equal to or higher than the Run Factor. is an expression for how “reliable” the department has been within a certain period of time: The Reliability Factor represents the time, where the system has been in actual operation related to the actual operating time together with the time the equipment could have been in operation, but was stopped for Incidental reasons. For convenience the period, that normally is considered, is the calendar time like the day, the month or the year. In this context it is important to remember that only stoppages for Incidental reasons should be taken into consideration. Impact:A low RUF will result in low production volumes. Non-performance of equipment due to unplanned downtime. Non-performance of equipment due to unplanned stoppages. The production (tons per hour) during the hours of equipment running (see RF). 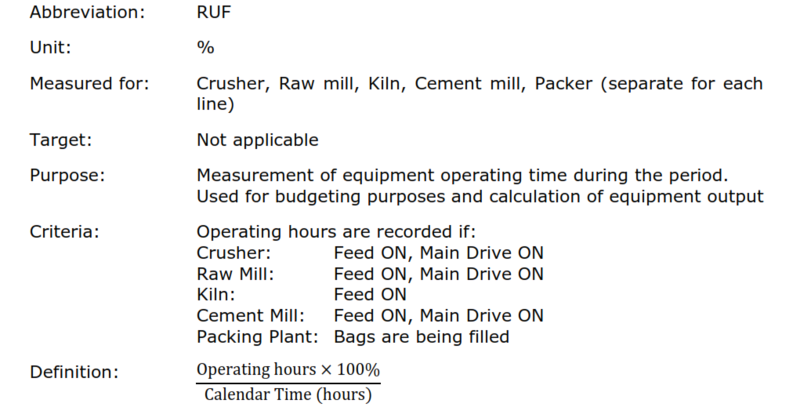 Note: Clinker production is determined by Kiln Feed usage * Clinker Factor. This factor is confirmed ½ yearly by conducting a clinker drop test. Impact: This factor shows the ability of the equipment to operate to its expected output. Degradation or wear of machinery. Causes of under-performance: Investigations should be carried out according to AF and PF. The LHV shall be the average of the individual heat values over the reporting period weighted by the amount of the different fuels used. Purpose:To measure the consumption of grinding balls, table or rollers in the grinding mills. Roller Mill: All kind of hard-facing carried out on roller segments and mill table elements to compensate for wear. e.g. Ball Mill, Vertical Roller Mill etc. Impact: High grinding media consumption will increase operating and consumable cost and reduces mill availability.